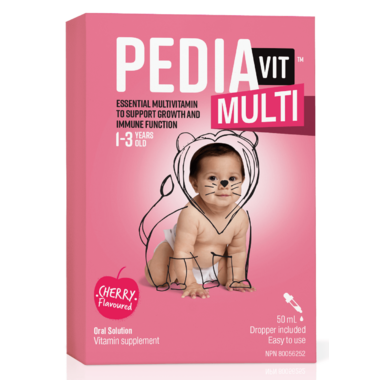 PediaVit™ Multi is an essential multivitamin to support growth and immune function. Vitamin A helps to maintain eyesight, skin, membranes and immune function and in the development and maintenance of night vision bones and teeth. Vitamin C helps the body to metabolize fats and proteins, in the development and maintenance of bones, cartilage, teeth and gums, in connective tissue formation and in wound healing, and is an antioxidant for the maintenance of good health. Vitamin D helps in the development and maintenance of bones and teeth, and in the absorption and use of calcium and phosphorus. Instructions for Use: Children 1-3 years (1 mL once per day) or as directed by a healthcare practitioner. Fill dropper to top line. Dispense directly into the mouth or mix with milk, fruit juice, cereals or other foods. Non-medicinal Ingredients: Butylated Hydroxytoluene, Caramel Colour, Cherry Flavour, Corn Oil, Di-alpha-Tocopherol, DisodiumEDTA, Glycerin,PEG-40 Hydrogenated Castor Oil,Polyethylene Glycol,Propylene Glycol,Purified Water, Sodium Citrate Dihydrate,Sodium Hydroxide, Sucralose, SunflowerOil.